Achieving tangible results is key in all sectors and allows organisations to attract, engage and retain the best talent. 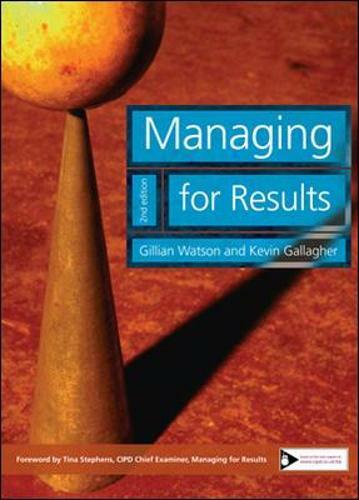 Managing for Results is a clear guide for HR and management students, as well as current managers and business leaders, to managing within a business context and achieving success. Blending research, theory and practice, topics addressed include the role and development of the manager within the organisation, communication in the workplace, organisational structure and culture, differentiating for excellence and implementing continuous improvement and change. This fully revised edition of Managing for Results is based on Michael Armstrong's Managing Activities and develops it by offering a strategic overview to management and critical perspectives across the subject area. It contains a wide range of features to support student learning, including case studies and examples from leading UK and international organisations, extracts from People Management articles, chapter focused learning objectives, discussions, work-related and critical question exercises, and clear chapter summaries. Your blueprint for achieving success as a manager, this title also includes an online companion site featuring a specimen exam paper and guidance on how to complete it.